Today I tackled R, S and T. In the spirit of the absurdity of this challenge I set myself I began with T.
That was easy, tea-towels. I have long noticed that I have far too many tea towels and some of them are really beyond a boil up with some bleach. Tea towels are insidious little wotsits. They creep up on you gradually, especially whilst you have young children. I defy any parent not to have a drawer full of the annual school fundraising tea towel, and probably several from their friends and nieces and nephews. Three Christmases later and you have a drawer full of handprints and wonky self-portraits. I still have a number of good quality linen tea towels that are as old as the hills if not older. Those without holes survived the cull and linen is much better than cotton as a tea towel. After that I kept a handful of good quality tea towels and it was “Off with their heads!” for the rest. 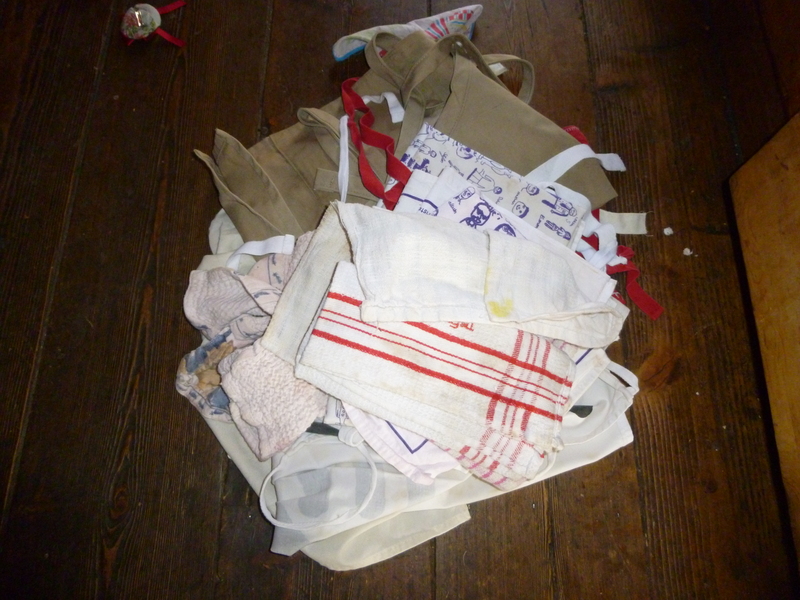 There are several aprons in this pile too as they were in the same drawer. I’ll have to think of something else when I finally get to A. S had to be shoes. 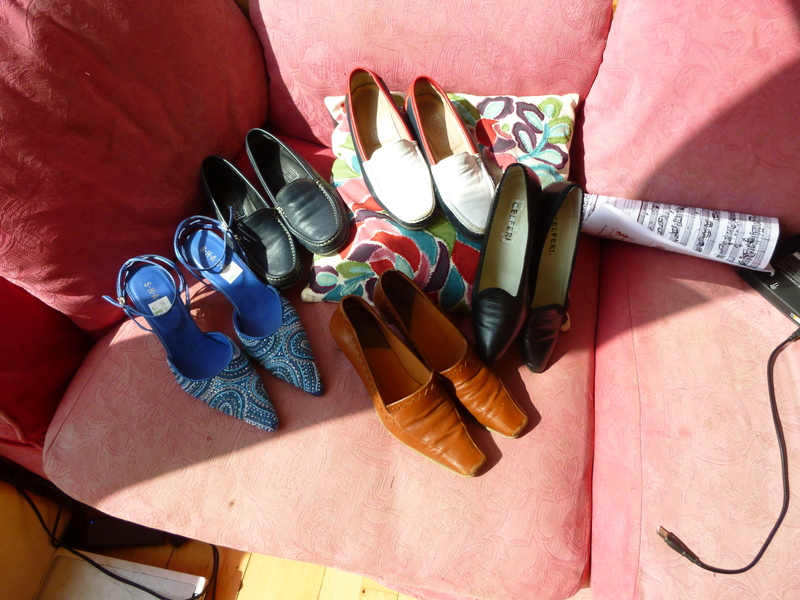 It was a pair of shoes that set off this blog, and I have always had far too many. Only a handful today. I felt that there were several more that could go too but I was wavering and this isn’t meant to be an in depth declutter but a short sharp shock. Which leaves R. R is for Reading Matter (it’s my challenge I can be as lateral thinking as I like 🙂 ) No problem here. 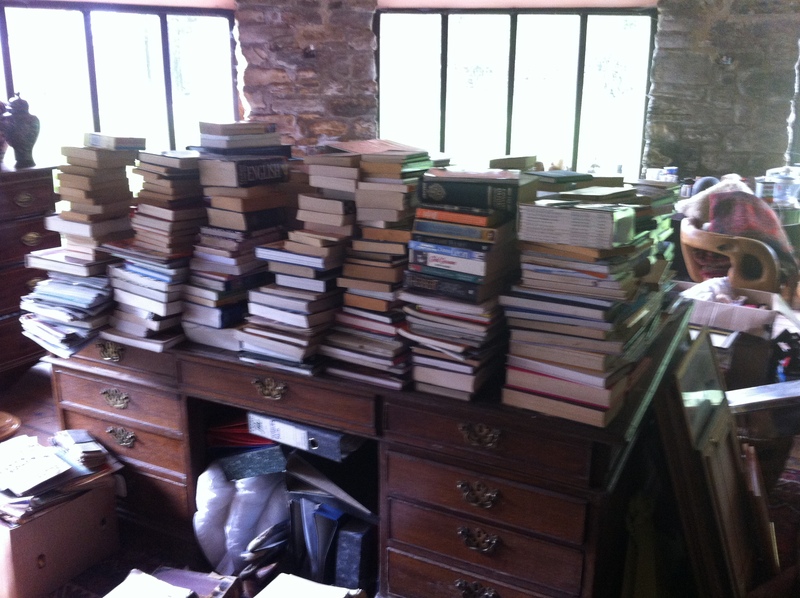 I have been eyeing up a shelf of unread and unwanted books for a while. 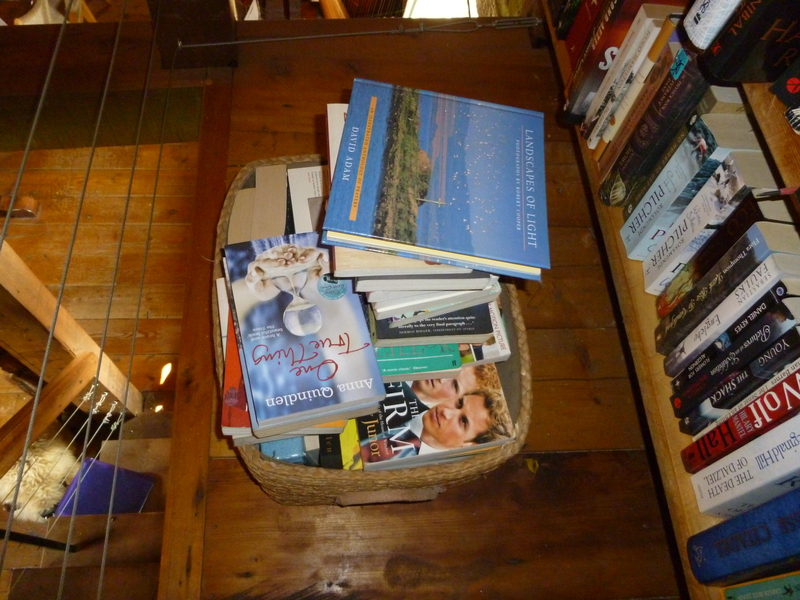 I hope they go to good homes where they will be loved and read from cover to cover. But that does not mean I have to slip into cashmere twinset and pearls (on the other hand I LOVE cashmere and pearls I just need to rock them with something a little edgier like a leather jacket to avoid looking like my grandmother). Consequently I signed up to 40plusstyle and the new year challenge. Each day you are given an assignment and are encouraged to develop a pinterest and polyvore board of your fashion choices and inspiration. Having just done a full wardrobe inventory and started recording what I was wearing each day I thought this might be a good way to help me use everything in my wardrobe and accept those things that just don’t cut the mustard. Today was footwear day. Make a list of all your shoes/boots (done that). Take one outfit and change it completely by just changing the footwear, now that was fun. Then I spent some time going through my favourite shoe shops and pinning the shoes and boots I liked. I then compared them to what I actually own. BIG mismatch. Okay, not disasterous, but there are far too many mummsy shoes in there and surprise surprise, I don’t wear them. I have five pairs of black suede court shoes from low to eiffel tower size heels. FIVE? I love biker boots but don’t own any. I hardly ever wear brown shoes and have 7 pairs. As part of the learning process I am not going to purge any until I get back from Australia. That gives me three months to give some of those shoes a chance. It is easy to just put on the black loafers I took off last night and just about go with everything. 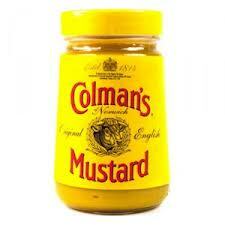 Then, it’s cut the mustard time. Several weeks back it rained. It rained a lot. 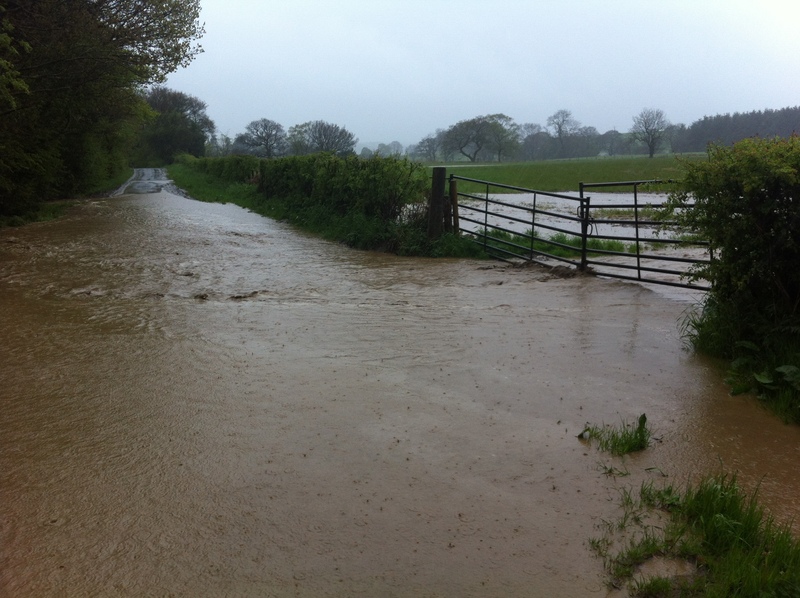 Having been caught out the previous year by the sheer volume of water pouring off the fields and into Singer Two’s bedroom we had our flood defence system in place. It was rubbish. It was the chocolate fireguard of flood defences and the muddy water took up residence in the Gin Gan, the Pantry, the Airing Cupboard and once again in Singer Two’s bedroom. Singer Two understandably did not take it well. The Dancer, on the other hand, desperate for a new carpet inquired whether she too could have a new Berber and underlay if she chucked a couple of gallons of water on her bedroom floor. The answer was no. However, there is a bright side to every cloud. I recently read Zero Waste Home by Bea Johnson. I bought it thinking I might get a few tips, but I was pretty sure I was doing okay. How the mighty are fallen. I am not even scratching the tip of the iceberg. And talking of icebergs that was what our house was. 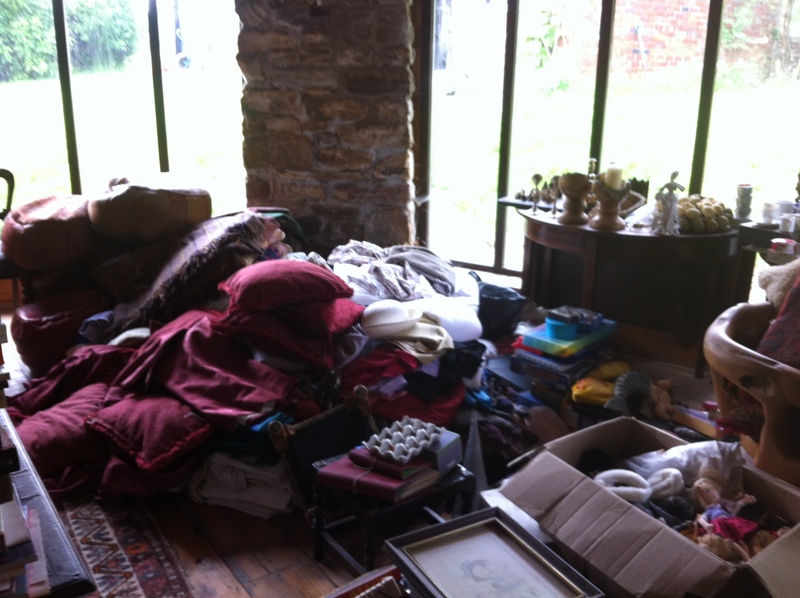 A small visible area and rooms and cupboards and outbuildings full of stuff we don’t need or use. The flood was my gift. I had to clear up and sort out so I might as well do it properly. It’s an odd process, at first you are ruthless, then a period of remorse sets in. “Do I really want to let go of this?” It is at this point that most people (often myself in the past) stop. But ride through that storm and the next stage is guilt. Guilt that we have bought so much stuff we didn’t need, didn’t use and didn’t really even want. The wastage of money, time, space, energy. But the feelings of guilt and shame were countered by the wonderful feeling of space in our house. The feeling that the air could move, there was no stagnancy. I am not finished, I have the outbuildings still to do and one study and the kitchen but already I have said never again. Never again will we accumulate and waste so much. So rule one is one in one out. Yesterday we were in Glasgow for the Springsteen concert (yes he was brilliant, but did you expect anything else?) Pootling around our old haunts in the West End I found these. Green suede Bally, almost unworn, my size £20 and I got the wooden shoe trees as well! So on my return I removed one pair of black suede shoes that have seen better days and added them to out piles growing in the Gin Gan. It’s a small start but one pair of shoes at a time I will bring this house as close to Zero Waste as I can. I may never achieve the dizzy heights of Bea Johnson but if you don’t have a dream there isn’t anything to come true.